Cheese Twists and a Simple Lunch Solution - Home. Made. Interest. 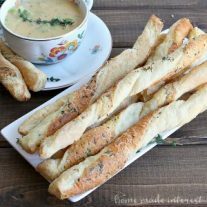 Cheese Twists are crispy, cheese breadsticks made with puff pastry, that go perfectly with a hot cup of soup. We have something really good for you guys today! 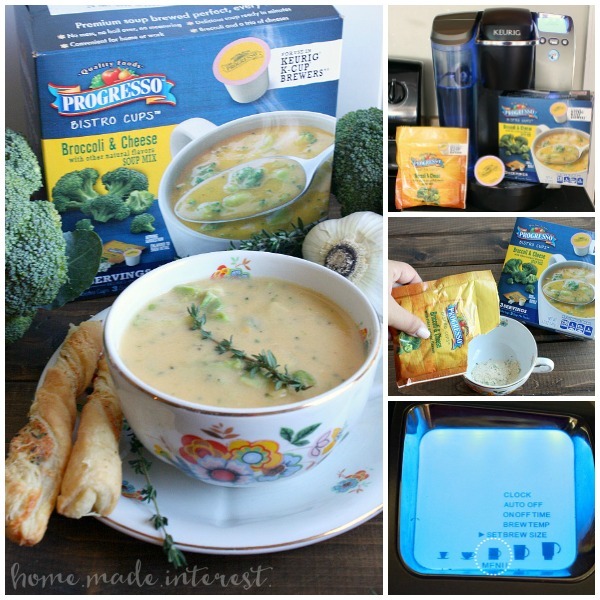 If you’ve been with us for awhile you know Melinda and I love our Keurig single serve coffee makers, they are awesome for making a quick cup of coffee or tea and now Progresso soup has a new product called Bistro Cups, that you can use to brew your own single serving of soup. Guys, I’m so excited about this! It’s winter, it’s soup season, and during this time of year I take Progresso soup to work for lunch, a lot. Progresso Bistro cups are super simple to use you just pour the packet into a mug, place the k-cup in the machine, and choose the correct cup size. Once the mug is filled give it a good stir and and let it sit for 1 minute. I made Broccoli & Cheese yesterday and it was so good! Progresso Bistro Cups also come in Tomato Parmesan, and Creamy Southwestern. Right now they are only sold in grocery stores in the Northeast US, and you can find them in either the soup or coffee aisle. Get a $2 off coupon HERE. Note: This post contains affiliate links. This mean if you click on a link and make a purchase we may receive a small commission. Thank you! I’m totally digging the convenience of these soups but you know I have to make something of my own to go along with them. I added a few simple ingredients to puff pastry to turn it into these easy cheese twists. All I had to do was roll out thawed puff pastry dough with my trusty adjustable rolling pin, add a little cheese, herbs, and spices. then I cut the dough into strips, gave it a twist and baked it on a silpat mat for about 20 minutes. Crispy, cheesy, breadsticks that are quick to make and are perfect for dunking my in soup (especially the Tomato Parmesan. Yum! 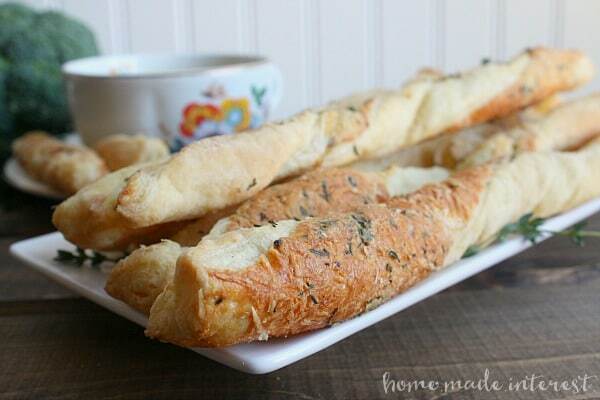 These crispy, cheesy, breadsticks are made with puff pastry. 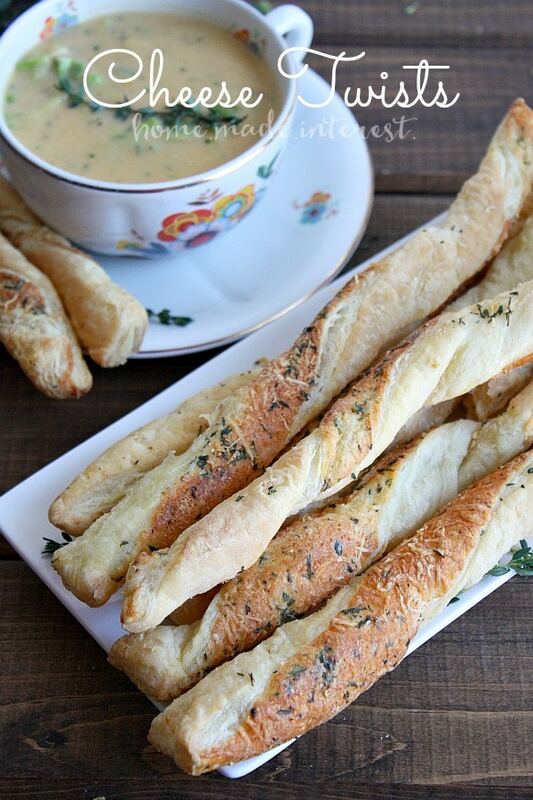 It’s an easy bread recipe that goes great with soups and salads. Unfold thawed puff pastry onto parchment paper or a silpat mat. Sprinkle a little flour on the puff pastry and roll it out into a 10" x 12" rectangle. Stir egg and water together and brush onto puff pastry. Sprinkle with pastry with cheese, thyme, garlic powder, salt, and pepper. Lightly roll ingredients into pastry. Using a pizza cutter cut the puff pastry into 12 thin strips. Twist each strip and lay on silpat baking mat on a baking sheet. Bake 15 mins, then flip and bake for 2-5 min or until golden brown and puffed. 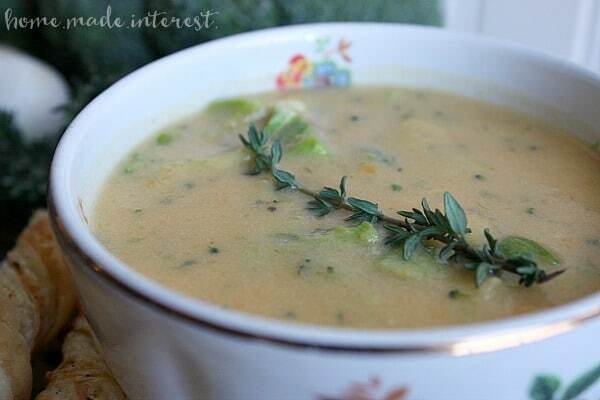 Which soup are you going to try first? This looks insanely delicious! Thanks! Thank you so much for this recipe = the other day I went to THREE different stores to buy these for a luncheon I had the other day and not a single one had them, so I improvised. I would have looked for a recipe but had to have them right then and couldn’t make them. I am soooooo making these soon. Yay. : – ) THX!!! !